The cases of Seven Bridges, 10, of Louisville, Kentucky; Rylan Hagan, 11, and Stormiyah Denson-Jackson, 12, both from Washington, D.C.; and McKenzie Adams, 9, of Linden, Alabama, are indicative of a rising epidemic occurring among young black people. The four were all said to be overachievers who did their chores and excelled in studies. But they also have another thing in common: They were all victims of alleged taunting and bullying at school, and they all hanged themselves. “There’s a sense of hopelessness that we perpetually experience,” said Dr. Michael Lindsey, executive director of the McSilver Institute for Poverty Policy and Research at the New York University Silver School of Social Work. “We feel that things aren’t going to get better. It almost feels like we don’t have time to be depressed about it. 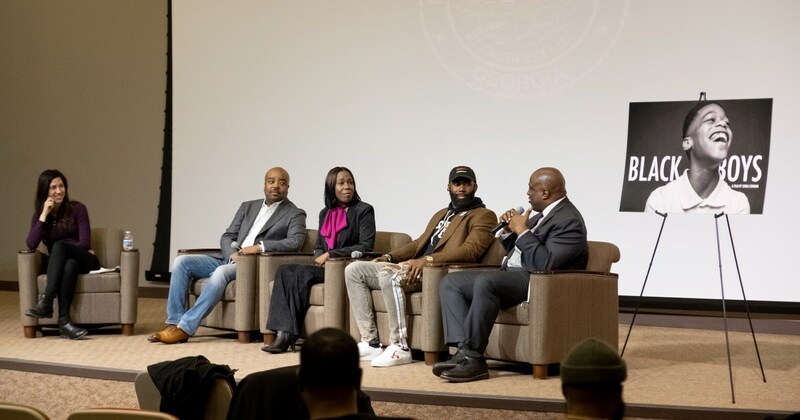 These situations continue to happen,” he said at a recent panel discussing black boys and mental health at his alma mater, the all-male historically black university Morehouse College. The Centers for Disease Control and Prevention found in a November report that suicide is the second-leading cause of death for ages 10 to 34. In another study published by the academic journal JAMA Pediatrics three years earlier, suicide in the United States doubled among black youth as opposed to whites, specifically ages 5 to 11. From 1993 to 2012, out of the 657 kids mentioned in the study who died by suicide, a significant increase in suicide rate occurred among black boys. Lindsey, an expert on race and adolescent mental health, assembled a panel of athletes, community leaders, filmmakers and human rights activists to exchange personal anecdotes, share additional research findings, and offer possible solutions for ways black boys can share their strengths and weaknesses with no judgment, consequences or repercussions. One of the first steps toward improving the lives of black youth is to create safe spaces for people of color of all ages, backgrounds and disciplines to share experiences and talk openly about issues relating to mental health, Lindsey said. He spent a great deal of time at the Morehouse town hall meeting examining how staffing in the primary school system often presents a major drawback for supporting black and brown boys. He mentions in one of his research studies that schools are among the largest providers of mental health services. Lindsey also concludes that more kids get mental health treatment in school than anywhere else. Panelists said improving mental health awareness starts by taking matters into their own hands. Philadelphia Eagles safety Malcolm Jenkins, who co-founded the Players Coalition, a social justice advocacy group with other NFL players, thinks back to when he saw LeBron James and Dwyane Wade at an ESPY awards show proclaim they would use their platform to advocate for social justice. That moment, Jenkins recalls, inspired him to seek therapy and work on articulating his feelings. He believes athletes and other public figures being more open about their personal struggles is a way to help alleviate stigmas around the black community addressing mental health. Campaign for Black Male Achievement CEO Shawn Dove said collaboration is the best medicine for mental health.